A powerful explosion ripped through a chemical plant in Eastern China, killing at least 78 people and injuring more than 500 others. The explosion happened at around 2 p.m. on 21st March, 2019 in Jiangsu Tianjiayi chemical co., Ltd. located in Xiangshui, Yancheng City, Jiangsu, P.R. China. A total 16 companies and a number of residential houses near the trigger point suffered losses of varying degrees. The accident has caused a series of insurance claims, including A&H claims, Property losses, Liability claims, Marine Cargo claims, Storage losses, BI claims and etc. vrs Adjusters and the local partner in China, DNZ Loss Adjusters and Surveyor Co, Ltd. are ready to provide their services to Local and Global Insurers and Reinsurers. DNZ is based in Shanghai and offers – in 35 Chinese cities – services of risk management consulting and inspection, evaluation and risk assessment, loss adjusting, onsite surveys and investigation. 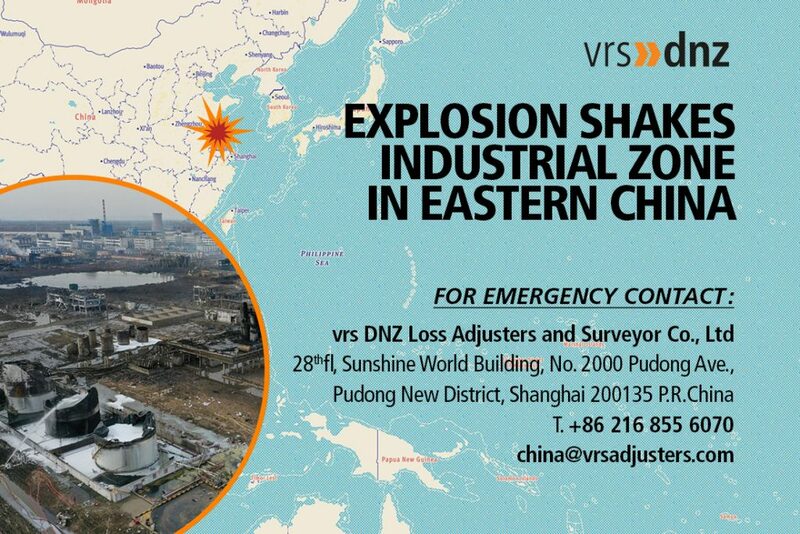 vrs DNZ Loss adjuster and surveyors Co., Ltd.